Are you ready to take back the Earth? Ready to finally take the fight to the Chosen? Well, get your Battleframes ready. Mark Kern, CEO of Red5 Studios, took to twitter earlier today to announce FireFall Open Beta Stage 2 is now underway. For the first time ever in Firefall, you will be able to take the fight directly into the Melding against the Chosen. No longer are you limited to simply defending New Eden against the Chosen Incursions. It will be up to you, and your fellow Battleframe pilots, to fuel the newly constructed giant Melding Repulsors to generate enough power to start permanently pushing back the Melding. Each time the Repulsor is fired, more and more of the Melding will be permanently pushed back. Once the Melding is pushed back far enough, you will discover secret Chosen fortifications that must be besieged and destroyed. Destroying these fortresses will unlock new Chosen technology that can be research crafted into future Battleframe gear and items. When the Chosen is defeated and the Melding is completely pushed back, you will be able to enjoy the fruits of your labor and fully explore the newly reclaimed area of Earth. Just be aware, you will be competing against other pilots to see who does the most in helping to reclaim the Earth. Top pilots will be rewarded with special rewards and commendations as well as having statues built, in their honor, in the new capital. The number one pilot will be rewarded with the additional honor of naming the city itself. 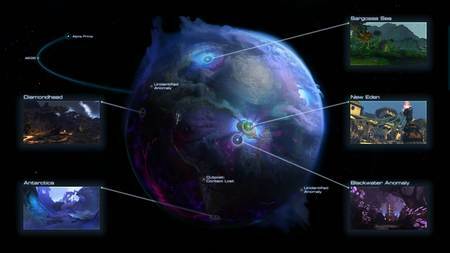 The war against the Chosen will continue as more Melding pockets are discovered and then pushed back. And it is up to you and the other pilots to determine the course in which the war progresses. The success or failure of the war against the Chosen will rest heavily on those choices and your determination. Not in the Open Beta, you can join the war at the official site.